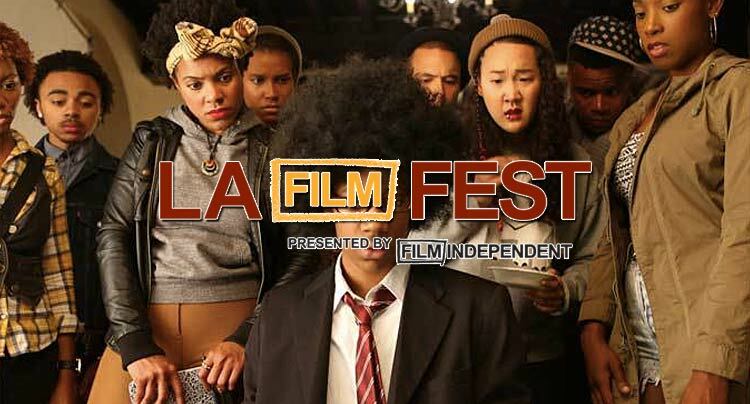 Before Wednesday’s Los Angeles Film Festival Gala Screening of Dear White People, director Justin Simien, along with exec-producer Stephanie Allain, told white members of the audience that they were absolutely “allowed to laugh”. An ominous sort of joke, but considering the deep satire contained within this Sundance favorite, it was a joke entirely in keeping with the film’s mood. Set on the fictional Ivy League campus of Winchester University, where different residential halls reflect certain stereotypes, race, and class distinctions, the film follows four black students with four different perspectives and different experiences dealing with the people surrounding them in our so-called (by some) post-racial society. Samantha White (Tessa Thompson, whom Veronica Mars fans will recognize), a bi-racial radical, hosts a radio show called “Dear White People” where she regularly offers sarcastic advice to white people on their interactions with black people. Her opening joke being that the acceptable number of black friends to have so as not to appear racist has just been raised to two, and your weed provider doesn’t count. Interspersed throughout the film, her jokes add a harsh but effective humor. Next we have Troy (Brandon Bell), son to the college’s Dean (Dennis Haysbert) and all around go-getter, he holds the title of Head of House over the historically black resident hall Parker/Armstrong. When the house’s election is sabotaged by Samantha’s friend Reggie (Marque Richardson), she ends up winning against Troy, bringing with her all the aggressive views she holds on the diversification of their house. Immediately she bans non-residents from eating in their hall, mostly meaning white students, and victoriously throws the privileged President’s son, Kurt (Kyle Gallner, another Veronica Mars star) and his comedy troupe Pastiche, out of the hall. Wishing she had as many YouTube views as Samantha is Colandrea ‘Coco’ Conners (Teyonah Parris), whose attention seeking ways have her vying for a spot on a reality show while doing her best to fit in with the white crowd. And last is Lionel Higgins (Tyler James Williams of Everybody Hates Chris), who is asked to write a piece on the racial tensions brewing on campus though internally he doesn’t believe he fits into either the black or the white crowd. The film shows the different ways these black students, and indeed anyone of any race, approach their own identity. Samantha, the anarchist seeks mostly to show the holes in society and the barriers we have yet to overcome. Troy, the somewhat two-faced people-pleaser, becomes what most impresses those in his vicinity. Coco compromises herself for the sake of fitting in. Lionel wants recognition for his writing abilities, not his race, while writing a piece on a culture he hardly understands despite belonging to it. All of their various experiences come to a head when one of the residence halls on campus decides to throw an African-American themed party with atrocious stereotypes in abundance and white people showcasing their insensitivity. Claiming a love for Robert Altman in the Q&A after the film, Simien similarly handles the heavy task of directing an ensemble cast with excellent results. The film is sharply written, out to prove that black films can feature intelligence and self-awareness and still be funny without any wigs, fat suits, or Tyler Perry tropes. Some of the story elements are slightly contrived, characters being the most extreme versions of themselves, but satire aims at showcasing ridiculousness and none of the more melodramatic choices Simien opted for detracts from the film’s social criticism. Progressive and humorous, the film teems with talent all around, but more than anything is a perfect catalyst for conversation.